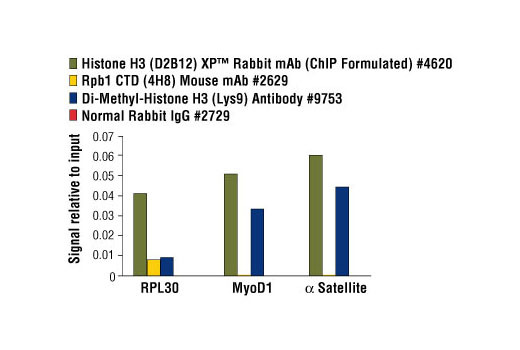 Chromatin immunoprecipitations were performed using digested chromatin from HeLa cells and either Histone H3 (D2B12) XP® Rabbit mAb (ChIP Formulated) #4620 (lane 2), Rpb1 CTD (4H8) Mouse mAb #2629 (lane 3), Di-Methyl Histone H3 (Lys9) Antibody #9753 (lane 4), or Normal Rabbit IgG #2729 (lane 5). Purified DNA was analyzed by standard PCR methods using SimpleChIP® Human RPL30 Exon 3 Primers #7014, SimpleChIP® Human MyoD1 Exon 1 Primers #4490, and SimpleChIP® Human α Satellite Repeat Primers #4486. 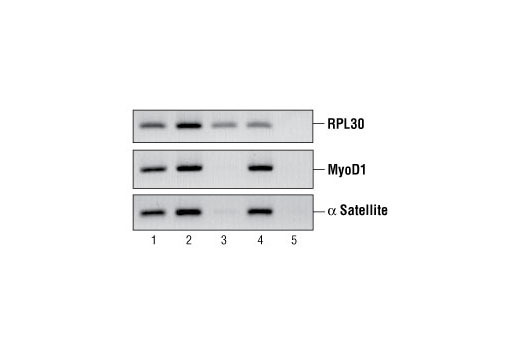 PCR products were observed for each primer set in the input sample (lane 1) and various protein-specific immunoprecipitations, but not in the immunoprecipitation using Normal Rabbit IgG #2729 (lane 5). Chromatin immunoprecipitations were performed using digested chromatin from HeLa cells and the indicated antibodies. Purified DNA was analyzed by quantitative real-time PCR, using SimpleChIP® Human RPL30 Exon 3 Primers #7014, SimpleChIP® Human MyoD1 Exon 1 Primers #4490, and SimpleChIP® Human α Satellite Repeat Primers #4486. The relative abundance of each DNA sequence enriched by protein-specific immunoprecipitations is compared to the amount of the same DNA sequence enriched by the non-specific Normal Rabbit IgG #2729 (background). Vortex tube briefly to resuspend the beads. Add 30 μl of bead slurry to each chromatin immunoprecipitation (ChIP) reaction. For bead washing and subsequent elution of immunocomplexes, the beads can be separated from solution using our 6-Tube Magnetic Separation Rack #7017. Place the tubes containing the beads in the Magnetic Separation Rack and wait 1 to 2 minutes for the solution to clear before carefully removing the supernatant. Remove the tubes from the Magnetic Separation Rack, add new solution and resuspend the beads by gently vortexing or rocking the tube. Supplied in PBS (pH 7.2), 0.05% Tween® 20, 0.1% BSA, and 0.05% sodium azide. Store at 4°C. This product is stable for 12 months.